This pest repeller is perfect for ridding your home and yard of a variety of different pests. This multi-unit pack uses alarms and lights to scare away pests in your yard. 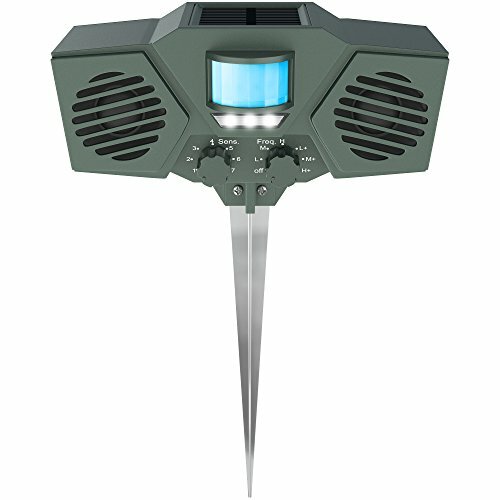 This outdoor solar powered pest repeller is great in all weather conditions at scaring pests out of your yard. Having bats in and around your home does not precisely pose any direct danger to you or your family, but you could run into some issues as a result. Having bats roosting in your house can cause a strong odor from the bat guano and urine, excessive noise from the bats fluttering around, and just an overall fearful feeling. Bats carry a lot of diseases and although it is unlikely–if you were bitten by one it could result in an infection. In this article, we are reviewing the best Ultrasonic Bat Repellers that are going to keep the bats out of your home for good. 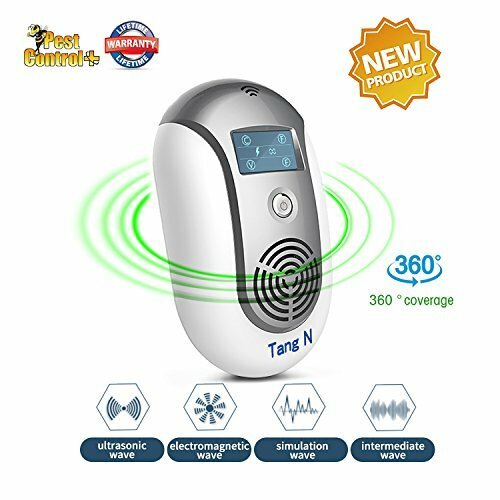 This bat repeller from TangN has multiple uses and comes with an intelligent UI and works through the use of ultrasonic, electromagnetic, and optical deworming. When compared to similar products this pest repeller has a better ability to penetrate walls, have a stronger range, and overall better results. One of the best things about this bat repeller is its simplicity to use. You plug it in and set it up and you’re ready to go, it works immediately once it is plugged in. The TangN Pest Repeller can rid your home of a variety of pests ranging from rodents, squirrels, bats, spiders, roaches, ticks, wasps, ants, silkworms, bees, and much more. The product also comes with a 100% lifetime warranty so if the repeller does not work within two weeks of your purchase the manufacturer will refund you or offer you a new one. 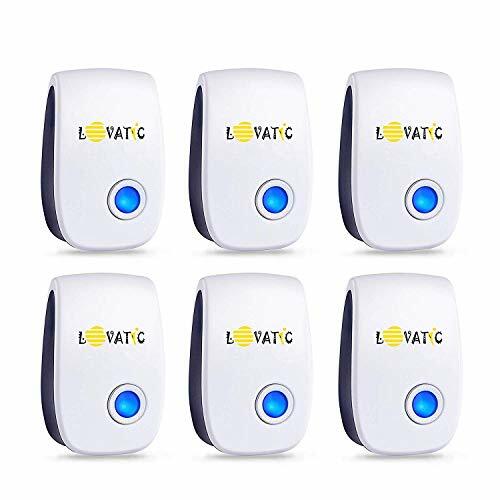 Lovatic Ultrasonic Pest Repellent comes in a pack of six indoor plug in devices that use ultrasound to keep bats away. Using ultrasonic and electromagnetic technology to keep not just bats, but all kinds of pests away from your home. Results showing in as little as one week. Each plug in can cover up to 1200 square feet with no messy sprays, odor or clean-up. You can plug in more in large open spaces to have more protection for you home and furniture. This product is safe for humans, eco-friendly, 100% non-toxic and contains no odor or insecticide components. The frequency used is specific to only insects, bugs and pests causing them to scramble out of your house. This ultrasonic pest repeller is very popular for powerfully removing all pests from your home through the use of ultrasonic sounds and flashing LED lights. This repeller has seven different settings to allow for a variety of different animals ranging from deer, cats, and dogs to rats, bats, and raccoons. This pest repeller works because of the ultrasonic waves and flashing strobe lights that scare away a bunch of different pests. The repeller also has an infrared motion sensor and three different frequencies. The Hoont repeller is especially popular because it is solar powered and requires no disposable batteries or wires. It has a solar panel directly on top that charges the batteries that come included with the repeller. The device also comes with an attached metal stake so you can drive it into the ground and move on. There are no chemicals, pesticides, odors, traps, or annoying sounds associated with this repeller. It is simple and not in any way harmful to the environment. It is also weather and water resistant. 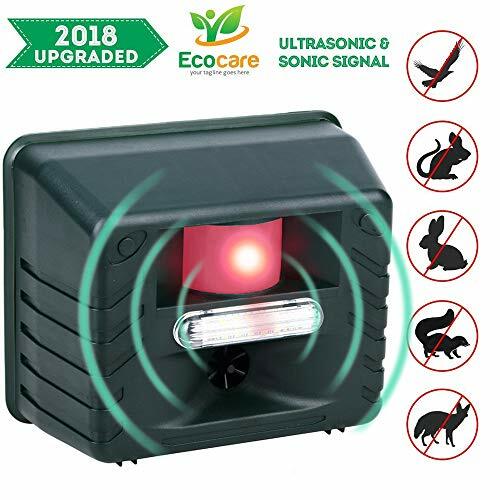 This battery powered ultrasonic animal repeller works at removing a variety of pests and comes with a few different settings to handle each situation. The repeller comes with an ultrasonic sweep and infrared motion sensor that is meant to locate the incoming animal and scare them away with the ultrasonic sound waves. This repeller also comes with an intruder alarm and an hourly timer so you can set the alarm to only go off during hours when you would expect to encounter a pest. This ultrasonic animal repeller is especially good at deterring flying pests like bats, crows, pigeons, sparrows, ducks, and seagulls. The YOYO GARDEN repeller is ideal for spaces no larger than 2000 square feet, so it works great on porches, balconies, garages, pools, and small enclosed yards. The pest repeller is also waterproof and capable of being put just about anywhere. It also comes with a long extension cord if you do not have any batteries. When choosing a bat repeller, you want to make sure you are getting the right tool for your situation, and every task requires a unique strategy. Each bat repeller is slightly different and can have different effects. Here are a few critical factors to consider when buying a bat repeller for your home. Not everyone is trying to remove bats from their yard or porch. If you have an indoor bat problem, you are going to need a different repeller than someone trying to get rid of outdoor bats. Be sure to factor this in when making your decision. There is many different types of bat repellers on the market, and different methods often power them. If you are trying to place the repeller away from your home you may need a battery or solar powered repeller–if you are putting it inside your attic, you might be able to use a corded one. This is super important to consider when purchasing a pest repeller because if you do not have enough range, it’s not going to do you any good. Some bat repellers are strong but have a short range while others are a bit weaker but have a far range. Be sure to know the range of your prospective product before making the purchase. Some bat repellers are strong but have a short range while others are a bit weaker but have a far range. Having bats outside and around your house is a pretty common issue a lot of people have but what happens when they get into your house or attic? Having bats in the house does not pose an immediate danger to you or your family, but there are risks associated with this issue. We’re going to go over a few steps you can take to help remove the bats from your home safely and effectively. The first and most important thing you need to do is find out how the bats got in. It might be intimidating to go up into your attic or room containing the bats but it’s an important step. Chances are the bats are not staying in that room all day and night, so if you can locate their access point, you may be able to plug it and prevent them from getting back in. Do not ever try and trap the bat. Bats carry a lot of diseases and while they do not typically bite, they will if they feel threatened and you could face a pretty nasty infection if you get bitten. Once you locate the potential access points, wait for the bats to leave the room. Be sure that all the bats have left and you are not trapping any inside. When all the bats are gone–close up all access points with a spray foam insulation–or something similar. Once you have gotten rid of all the bats in your room–be sure to clean all of the bat guano from the room. Bats leave a lot of waste behind due to their diet and bat guano can corrode wood or metal, has a powerful odor, and can attract additional pests like cockroaches. Chances are you may have to use a specialized fogger to break down all of the waste so it can be vacuumed up and cleaned. Be sure to wear the proper protective equipment when doing this.